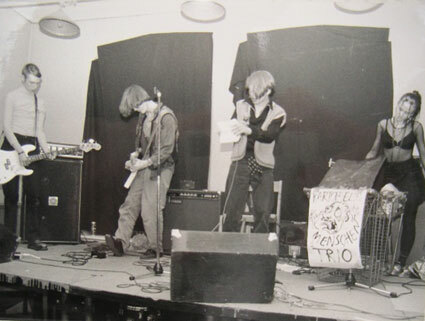 Kartoffel Menschen Trio existed between 1993-94. Hailing from Mölndal, south of Gothenburg, they were a vital part of the "Maybe Mölndal" scene which flourished at the time (other bands worth mentioning are Elflord, The Groovy Hate Fucks and Musik Snobb). The band was comprised of Fredrik Eriksson (bass), Lotta Hellstrand (metal drumkit), Hampus Pettersson (bass), Foto-Martin (not pictured (bass)), Peter Z (vocals) and some drum machine which was dubbed Dogge Doggelito. Kartoffel Menschen Trio played two shows in Gothenburg before disbanding, one at a birthday party in Frölunda, during which they were pelted with beercans for the entirety of the show, and one at the Haga movie theatre during their annual Rock Music Film Festival. During their performance at said festival some German director, who had done a Nick Cave documentary, commented on the band as "a confused version of Einstürzende Neübauten", pleasing them endlessly.